Here is the Avon Campaign 9 2018 Brochure. It is full of Mother's Day gift ideas. This is the ultimate gift guide for Mother's Day. Many items are limited editions so get them now. There are great fragrance gift sets, t-shirts, mugs, and lots of my favorite - jewelry! The packaging is so nice many of these items don't need any more wrapping. Orders of $40.OO or more can get free shipping. You also can use code coupon WELCOME10 for 10% off of your order but this is a one time code coupon. 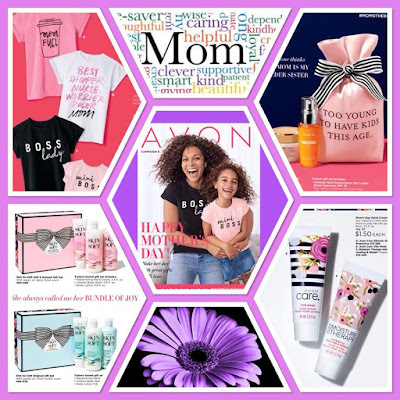 There is a new Avon Campaign available every two weeks. The Campaign brochures have new products as well as sales and deals every time. You have time to order your Mother's Day gifts and get them in. There are lots of great looks in Avon Campaign 9 2018 for you and for your home. All of the items pictured are available and more. You can order from my eStore 24 hours a day. There are three ways to order.